Looking for hotels near RDS? Premier Suites Plus Dublin Ballsbridge offer contemporary all-suite accommodations in the area of Ballsbridge, just 10 minutes' drive from Dublin city center. Just a 15 minute walk from Sandymount Strand the Andorra Bed & Breakfast is a 10 minute drive from central Dublin. Rooms feature showers, TVs and free parking is available. Basement Apartment is a self-catering property located in Dublin near RDS. 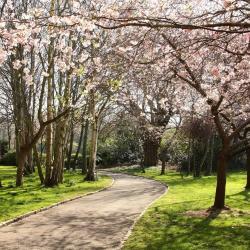 Overlooking the 48-acre Herbert Park, this hotel is 325 ft from the RDS and a 5-minute walk from the Aviva Stadium. This stylish, modern hotel has an award-winning restaurant and modern rooms. Located on Grand Canal Square in the heart of Dublin’s business and cultural quarter, The Marker features a ground-floor cocktail bar & brasserie, free WiFi and a spa with 4 treatment rooms and a... Atmosphere around the accommodation was great. This luxury boutique-style hotel is in Ballsbridge, 1.5 miles from central Dublin. It offers free parking and stylish rooms with free Wi-Fi, most with saunas and spa bathtubs. The little sauna in the room was a great luxury. Spa bath was really relaxing. The Shelbourne Hotel, Dublin is a historic, landmark hotel located in the heart of Dublin on St. Stephen's Green. Very helpful staf from the valet till checkout and returning the car outside on time. This 5-star luxury hotel is in Dublin city center, opposite the National Concert Hall, 1969 feet from the shops of Grafton Street. It has air-conditioned rooms and a stylish restaurant. Great service and comfortable bed. Located in Dublin, 1 mi from RDS, The Devlin features views of the city. 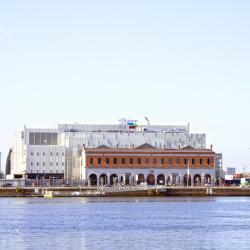 1.4 mi from Grand Canal, the hotel features a rooftop bar and restaurant, as well as a cinema. Location and it’s quirky style room perfect for one night or weekend away. Next to the river, this 4-star hotel overlooks the Bord Gais Energy Theater. Guests can enjoy its spacious rooms, 22-yard swimming pool, and health club, just 10 minutes’ walk from the 3 Arena. The pool, hot tub and spa were great. Dublin’s Hampton Hotel is located in the popular suburb of Donnybrook. 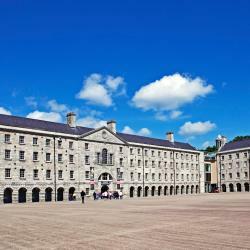 The boutique hotel offers luxury accommodations and is close to the RDS, the National Concert Hall and fine restaurants. Everything, rooms are really nice. 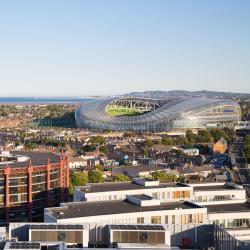 Located next to Dublin's Aviva Stadium, this family-run hotel offers free WiFi, private gardens, and free secure parking. Your staff,atmosphere,food&drink. Featuring a bar, The Draper Rooms is located in Dublin, a 5-minute walk from Merrion Park. Everything! I love this hotel! It’s right above an amazing local pub. 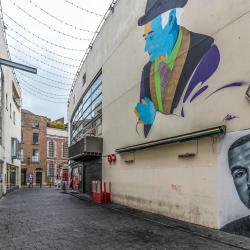 The 4-star design hotel is located in Dublin city center, steps away from the National Gallery, Trinity College and 2297 ft from the shops of Grafton Street. Stunning hotel, decor was amazing. Beds really comfortable and staff helpful and friendly! Hotels with great access to RDS! Located in Dublin, within a 14-minute walk of Fitzwilliam Square and 1.1 miles of St. Stephen's Green, Ranelagh Rooms has accommodations with free WiFi. I love everything about the place, the location and the concept! Stunning, chic decor and spacious rooms with Italian marble bathrooms are offered at this 5-star boutique hotel. 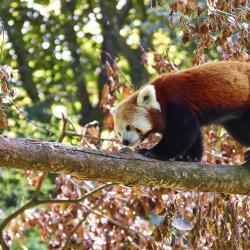 Dylan is just a 10-minute walk from the RDS and the Aviva Stadium. Always comfy beds and clean rooms! In the heart of Dublin's Georgian Ballsbridge district, Waterloo House offers 4-star luxury guest accommodations, free Wi-Fi, free newspapers and free parking. Loved the decor, the front parlour, and our room. I liked the complementary paper in the morning. Overlooking the historic Grand Canal, The Hilton Dublin is a 15-minute walk from the famous St. Stephen's Green and Grafton Street. Underground parking is available. Very comfy bed, excellent room service, very friendly staff. 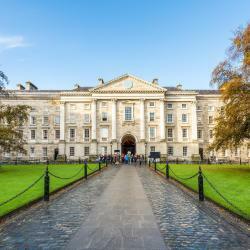 Located in central Dublin and a short walk from St. Stephen's Green and Trinity College, this Georgian townhouse offers free Wi-Fi and free guest parking. 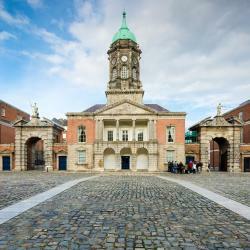 The location was perfect for a walking tour of Dublin. 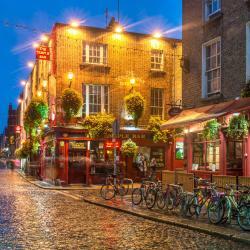 The Lansdowne Hotel is a 10-minute walk from Dublin’s Aviva Stadium and the RDS. This boutique hotel offers spacious rooms and home-cooked food. Free Wi-Fi is also available throughout the hotel. A classic Georgian building but modern fixtures and well-appointed in the rooms. People are talking about RDS! Explore guest hotel reviews featuring "RDS"
This apartment was huge. My wife, my daughter and myself had plenty of room and we easily could have slept a few more. The apartment was super clean and had a very well stocked kitchen. With a corner store literally a few yards away from the front door, we enjoyed cooking ourselves breakfast every morning. There was also a washing machine in the apartment, but to dry clothes, you needed to go down the hall, which was not a big deal . This was super helpful, especially for a long vacation. The apartment was well furnished and had lots of useful amenities such as hair dryer, iron, washing machine. 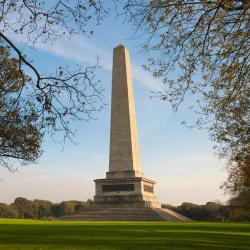 It is in a lovely district of the city and well situated for exploring Dublin as there is a tram stop right outside. The apartment has a nice view and there are plenty of places to go to eat nearby in easy walking distance. The apartment is very secure as there are several doors and gates which require access cards or keys. It was a no hassle experience from the moment we walked into the hotel. Paid cash, no deposits or credit cards needed. Staff was super friendly and took care of all our requests and needs. They even opened the breakfast for us 15 minutes early as we had to leave by the time it normally started. Great job guys! Stayed in private double room with my husband. Definitely small by American standards but definitely meets your needs. Only drawback was toilet didn’t usually have enough water pressure to flush properly. However seemed to be a common issue in Dublin toilets. The staff was able to work with us on getting a better room as the initial one did not live up to the standards that they said that they have. There is a bar in the lobby to help get over the fact that the hotel is poor. Group of us travelled down to Dublin for the marathon and afterwards the hotel had rooms set aside which allowed us to get showered and even offered a free pint to all runners. Best Hostel I ever staid. Very nice and friendly atmosphere. Friendly staff. Congrats to Florin from reception. Only good words for this Hostel.